This famous Book of Fables, which are always referred to as Aesop's Fables, date back to the 5th Century BC. Fables are short stories which illustrate a particular moral and teach a lesson to children and kids. The theme and characters appeal to children and the stories are often humorous and entertaining for kids of all ages. Fables can also be described as tales or yarns which have a message in their narrative such as a parable might have. Fables can often pass into our culture as myths and legends and used to teach about morals to children and kids. Aesop's famous fables and scripts provide great entertainment for children and kids. 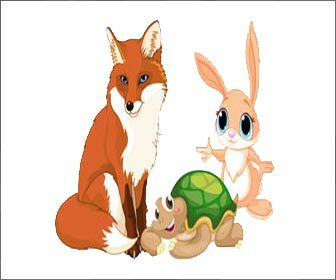 The fables, or stories, are all very short so keep the attention of children and Aesop's fables feature familiar animals loved by children and kids. When were the first of Aesop's great Book of fables written? It is not known exactly when the first Book of Aesop's fables were written as the fables were originally handed down from one generation to the next just like a myths, tales and legends. It is, however, believed that Aesop lived from about 620 to 560 B.C. Who is Aesop? Aesop is the name of the man credited with the authorship of a collection or book of fables. Aesop was a slave who many believe lived in Samos, a Greek island in the eastern Aegean Sea but others say he came from Ethiopia. The name of his first owner was Xanthus. It is believed that he eventually became a free man. In Aesop's biography Planudes describes Aesop an ugly, deformed dwarf, and the famous marble statue at the Villa Albani in Rome depicts Aesop accordingly. Who is Aesop and where was he born? There are many possibilities relating to Aesop's place of birth, although he certainly spent much of his life living in Greece at the court of King Croesus in Athens. Suggestions for Aesop's place of birth include Thrace, Greece, Phrygia, Ethiopia and Samos. Who is Aesop and what did he look like? His very name, Aesop, may however give us a clue to his country of origin. The name Aesop is derived from the Greek word Aethiop which means Ethiopia! And Aesop was described by Maximus Planudes (c.1260-c.1330), the Byzantine scholar who wrote a biography of Aesop and a prose version of Aesop's fables, as follows "His visage was of black hue". In Aesop's biography Planudes describes Aesop an ugly, deformed dwarf, and the famous marble statue at the Villa Albani in Rome depicts Aesop accordingly. When were Aesop's famous fables first translated into English? Aesop's fables were first printed in English by William Caxton in 1484, from his own translation made from the French. Aesop's fables were not believed to have been written as Children's literature and the book of fables were originally used to make thinly disguised social and political criticisms. The similarity to parables or allegories can be seen in most of the short tales in Aesops Book of Fables. Many of Aesop's fables in this compilation from the book have in fact since been found on Egyptian papyri known to date between 800 and 1000 years before Aesop's time. This clearly cast doubts on the authorship of many of the fables attributed to Aesop and the Aesop's Fables book. Many of the fables were possibly merely compiled by Aesop from existing fables, much in the same way that the Mother Goose Nursery Rhymes were but a new compilation of existing rhymes! The Morals, Sayings and Proverbs featured in the Book of Aesop's fables ensure that they still have meaning for us today. All of the famous fables by Aesop are featured on this site. They are printer friendly and the favourite of these kids and children's fables can be chosen and printed to create a tailor made book of children's fables by Aesop. Our Free Aesop's Fables have a moral to the tale or story which is useful to use in the education of kids and children.